Enter a title for the view page here. Further information about this topic can be found here. 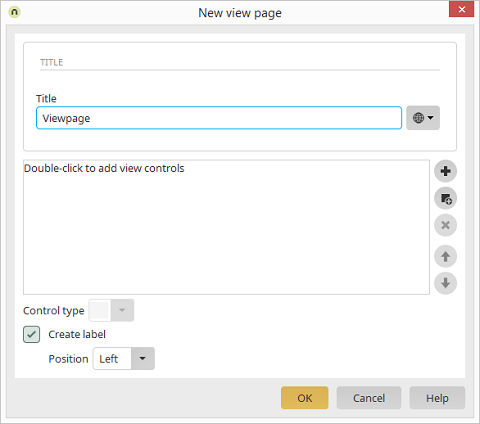 Add control Opens a dialog where existing data fields can be selected for the creation of view elements. Remove control Removes the currently selected control. Adjust the order of the elements in the list. In this drop-down list, select the format with which the contents of the control are to be displayed in the browser. Here, you will define whether the title of the control – the caption that explains which field is being addressed in the browser – will be created above or to the left of the control. The title and the position of the title cannot be chosen when creating a page with an accessible layout. The title will be automatically created to the left of the view control.